Can you charge my shipping account ? We are unable to charge your FedEx/UPS/DHL account at this time unless Numato Systems agreed to do so in writing prior to placing the order. Please contact us prior to placing order if you prefer to charge your shipping account. Do Numato Lab ship internationally? We do ship to most countries with very few exceptions. A complete list of countries where we ship can be found during the checkout process and your country can be selected. International orders may attract customs duties/taxes in your country and which is beyond our control and we are unable to give any estimate about how much the duties will be. You may visit your country’s customs department website to get more information about applicable duties. The carrier may levy additional clearance charges if they do customs clearance for you. Please contact the carrier’s office in your country to find out about the possible charges that may be levied. Please note that we * DO NOT * collect any customs charges or related additional charges/taxes when you place the order with us. By placing order with us, you agree that you will be responsible for paying any Duties/taxes levied by any government/non-government agency including but not limited to your country’s customs department and carrier after the product leaves Numato premises. In no situation, Numato will be liable to pay any duties or charges levied after the shipment is handed over to the carrier. Please note that altering bills, invoices or other shipping documents for the purpose of avoiding potential import/export duties or taxes is illegal in most countries and we are unable honor such requests. Shipping rates will be automatically calculated during checkout process based on the weight of the items and the shipping destination. 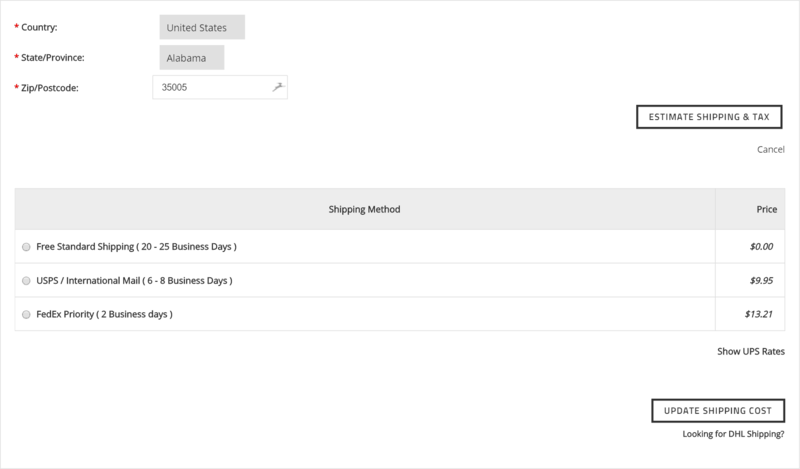 You can find the estimated shipping charges by visiting the shopping cart and entering your Country, State and Zip code. The shipping estimate also will display estimated time for delivery at the selected destination as well. An example estimate shown below.